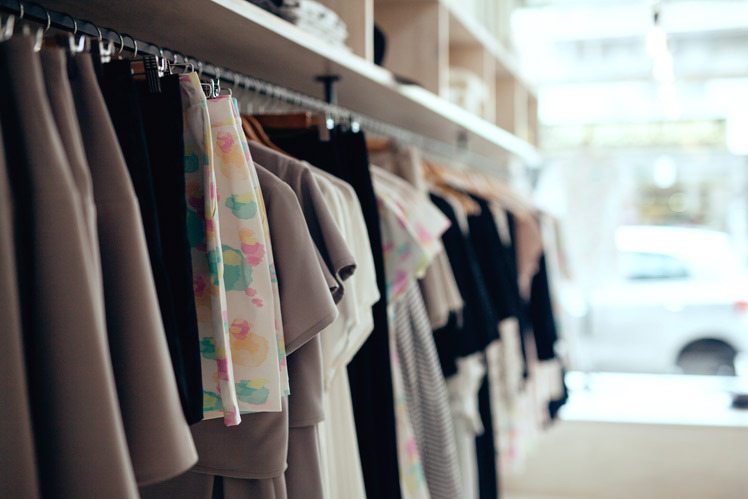 Melbourne based fashion label APOM is collaboration at its best. We love that Kajsa & Kate, the founders and designers of this locally made label, met in their final year of university and from there have not only founded a label, but opened a flagship store too! 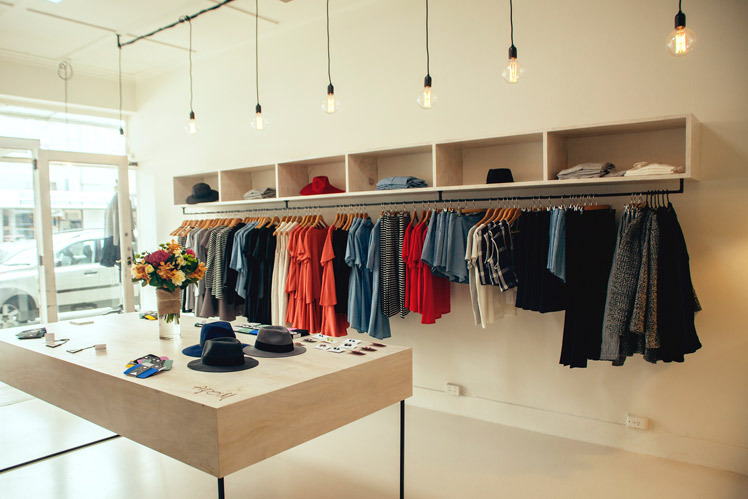 Read on and discover more about this local Melbourne gem. 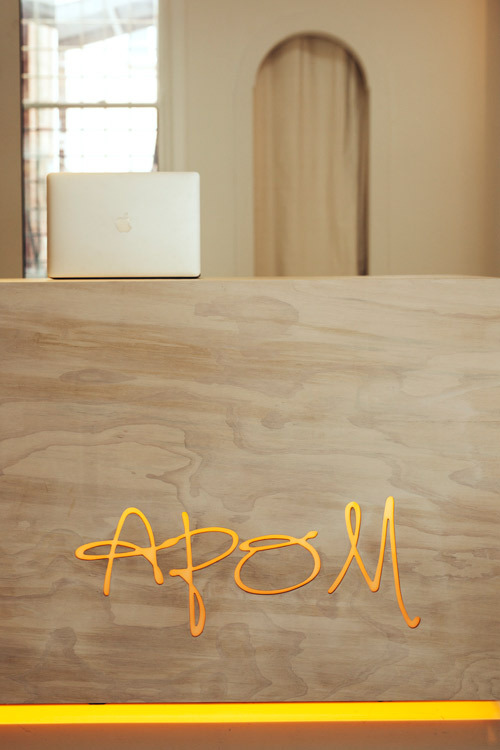 Tell us a bit about your shop APOM and the concept behind it? Our Shop is located in sunny Balaclava in Melbourne. We worked closely with furniture designer Ben Latimer to develop a Scandinavian inspired space that pays homage to the natural world. We both feel a close connection to the natural world and tend to be drawn to natural fibers and organic prints. He used a lot of white washed finishes on the timer to bring out the beauty in the natural flaws in the wood. We were originally looking to move to a bigger studio. But then we came across this space that had a shop front and a studio, we fell in love and decided that APOM was ready for a new challenge. So we spent about 7 weeks renovating and opened the doors in October, and we have loved every second of it. We stock the entire APOM collection that is punctuated with some incredible independent Australian and international labels. 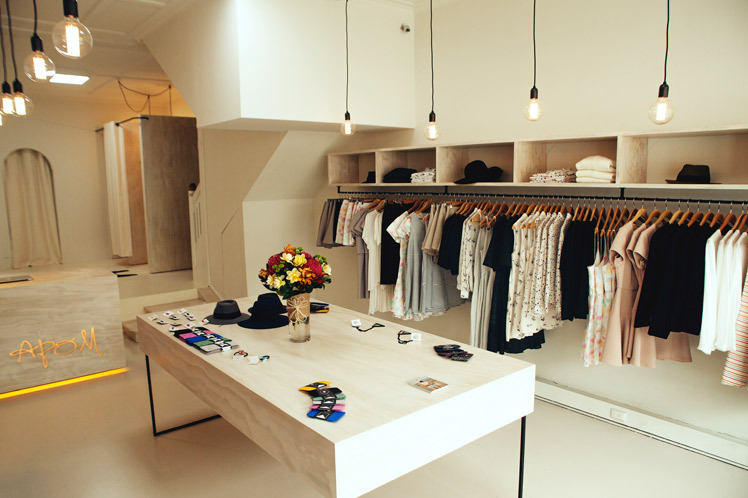 Brkich– Melbourne based label that has the best screen printed garments. 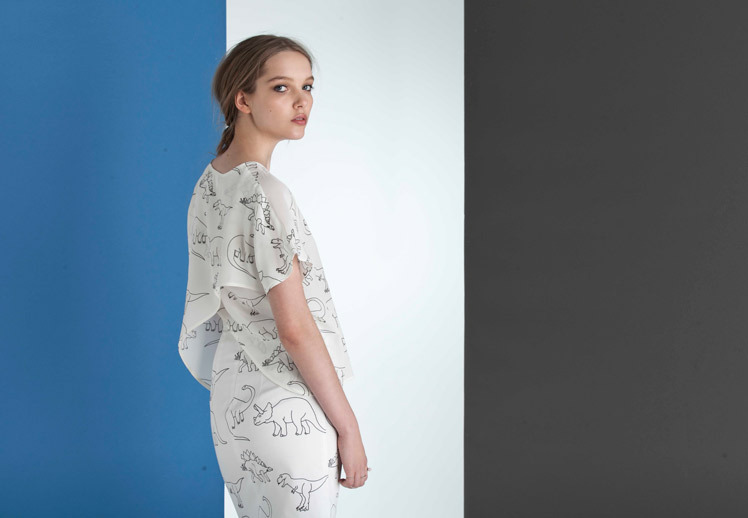 Soon we will to be stocking the new collection by Milk and Thistle. We are always on the hunt for new items for the store. 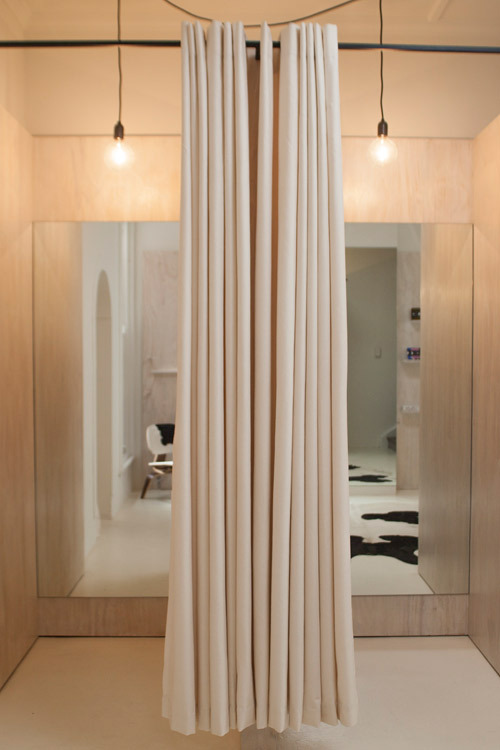 We love makers and designers who put a little bit of them selves in their designs. Our customers have really responded well to the fact there is a story behind every piece in our store. I don’t think we will ever get sick of getting in new stock. We both gush and squeal like little kids at Christmas. It’s such a beautiful space, filled with natural light and beautiful things, we find it a real treat coming to work everyday, and of course being so lucky to work along side a best friend. Having a great workspace can be the most inspiring of all, but when we design we usually make a story for the collection based on something that we have seen or done lately. The story could be anything from a book one of us has read to a little day trip to the country or beachside. We are situated in Balaclava, which is a very eclectic area. There are loads of coffee shops, bakery’s and bars. Lets just say you will never go hungry or un-caffeinated near the shop. We have both lived in Melbourne for years and are still finding new places to explore, eat and drink all the time. Starting a business has been enormous amounts of hard work. The first year was when we made the most slip-ups, we were fresh out of uni and really had no idea what we were doing. We learnt hard and fast how important it was we were on top of all aspects of the business at all times. A massive challenge was renovating the shop within our budget, but with the help of our builder Ben, we managed to do a lot of renovations our selves. Before the shop we had never painted, sanded or filled in gaps in a wall, it was exhausting, stressful but completely rewarding. We now feel we are a bit of reno experts. We have some really incredible designers coming in to the store; we can’t wait for winter to arrive; Australian designers are really on their A game at the moment. We are working on another swimwear range for summer, which will be exciting. Also working closely with another Melbourne artist to develop a fun and quirky print for the next collection and we are hoping to start to experiment with some accessories ideas. It is going to be a great year! I am so proud of this girls , the shop looks absolutely fantastic, but the best part of it is the love and dedication put into these amazing clothes and accessories.